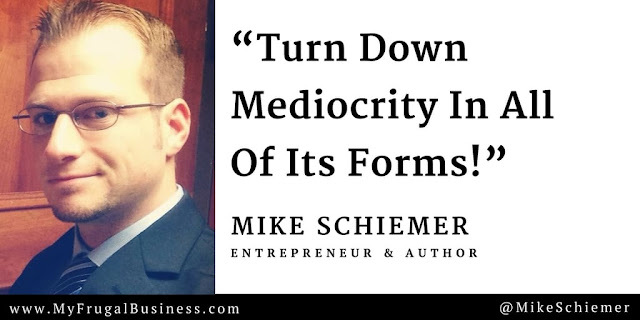 Michael Schiemer (creator of Bootstrap Business and author of The $10 Digital Media Startup) has always been a big fan of motivational quotes for entrepreneurs. As a former trainer, coach, and consultant, Mike Schiemer has spent thousands of hours helping to motivate people from all walks of life to improve their performance. While motivational quotes are just words to some, the power of inspiring quotes when combined with drive and action can be astounding. Entrepreneurs and startup managers especially need to continue to refill the bucket of motivation because their jobs are never over and the work can become draining. 1) "You don't want to just get by, you want to get ahead. You don't want to settle for mediocrity, you want to strive for greatness. You don't want to get lost in the crowd, you want to stand out and lead the charge." 4) "Strive to become highly sought after and indispensable by being the absolute best option for your clients and employer." 5) "Learn more about your industry than anyone else and practice what you preach." 6) "Stay alert and be ready to open the door when opportunity knocks." 7) "Sometimes you have to make real sacrifices to reach your goals. That's just the way life is. You can't always have everything." 8) "It's not easy starting out. You have to start small, pay your dues, outwork your competitors, innovate, be resourceful, and stay hungry." 9) "Build a reputation for getting things done and doing high quality work." 10) "Nobody wants to hear about the reasons why you couldn't do something, why a task was difficult, or factors preventing you from accomplishing the goal. Just get the job done or move over so someone else can do it." 11) "You can have the best website in the world, but if nobody visits it then it's all for nothing." 12) "When it comes to marketing, make sure you build a bold new brand and not something old and bland!" 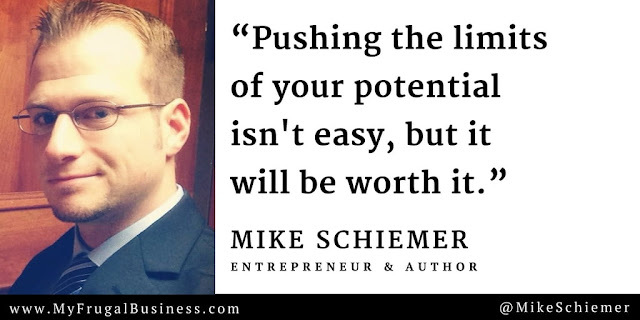 I hope you enjoyed this compilation of motivational entrepreneurship quotes from author and marketer Mike Schiemer. Interested in more articles about Michael Schiemer's marketing?